Two years ago, when Wigmore last came to WGTC for their Millennium Cup match, there was unbroken sunshine, which gave Clare, Wigmore’s vice-captain, a tan line that apparently lasted the whole summer. No such luck this year, on Sunday 7 April, with the sky displaying a perfect blanket of thick, grey cloud but, on the upside, there were only a few drops of rain throughout the day and there was next to no wind. 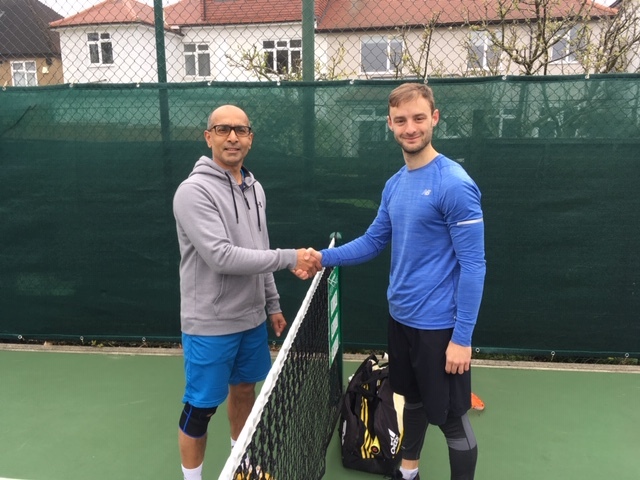 The first round matches kicked off with the men’s open singles and some very solid play by both WGTC’s Tom and Wigmore’s Partha meant that the gathering crowd for the Millennium Cup were treated to some excellent rallies and some impressive displays of athleticism. In the end Partha’s solid play and excellent volleying proved too strong, but the general consensus was that the scoreline really did not reflect the quality and closeness of the match. Meanwhile, in what turned out to be the longest match of the day, WGTC’s Andrea fought it out with Linda in the women’s vets’ singles. 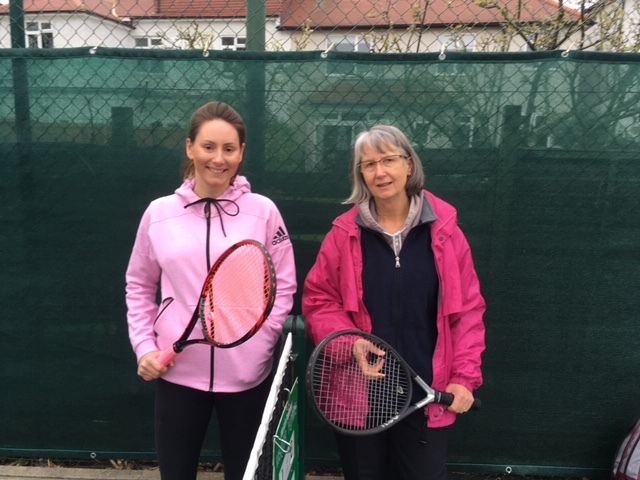 All games were close, all sets were tight, even the first set tiebreak was nip and tuck, and then we had to endure the dreaded match tiebreak, which, sadly for WGTC, would not be the first to go Wigmore’s way, Andrea losing it 5-10. On centre court, John & Carole could not find their feet until the second set and, although there was a valiant effort to try to fight back, Fabio & Clare were on better form on the day. 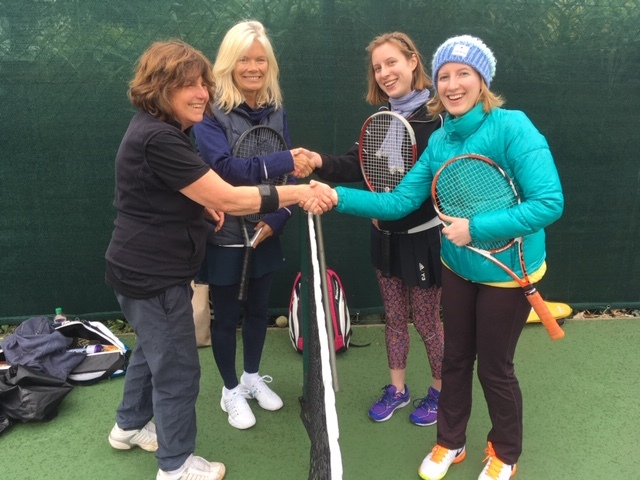 We were able to put WGTC’s Izzy, Blaise’s daughter, and Wigmore’s Edie on court 4 (not originally booked for the Millennium Cup) to start the junior girls’ singles, while Andrea & Linda finished their epic match, which meant that we were broadly keeping to time. 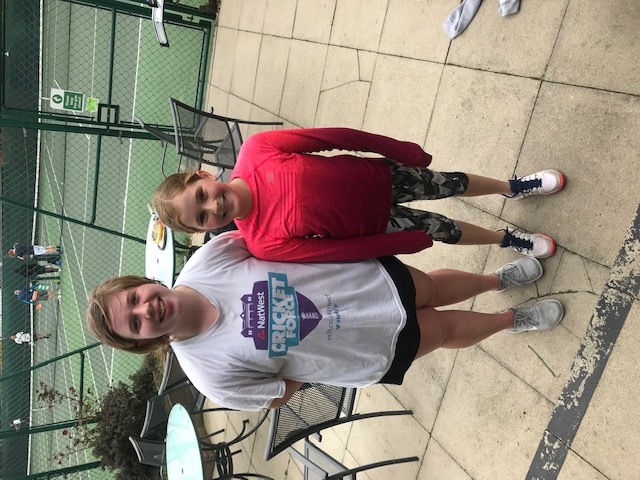 It was Izzy’s first experience of playing a tennis tournament and she made a spectacular first impression by taking the first set 6-4, a great start that Wigmore’s Edie was not going to take lying down. Edie blasted her way through the second set and, in spite of some long hard-fought battles, took the second set 6-1 meaning that WGTC was facing another match tiebreak and, yes, again, Woodfield went down 5-10. It was nevertheless an all round excellent match and one of the best Millennium Cup junior debuts by Izzy we have seen for years. 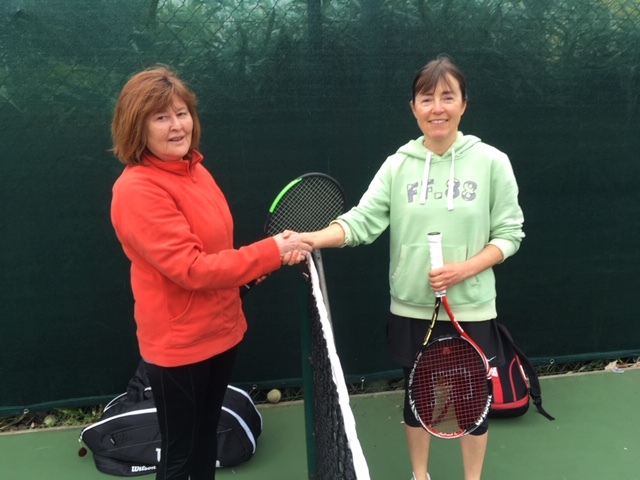 Meanwhile WGTC’s vice-captain Jo had started her singles match against Lynette on court 1. The first set had gone Jo’s way, but it was clear that Lynnette was suffering from the BBQ smells, which were wafting her way, and when Andrea & Linda finally finished their match, this rubber was moved to court 3, away from Head Chef’s Blaise’s invigorating aromas. Jo took the second set 6-0 and we are happy to report that it was clearly not the quality of the food on the BBQ that was putting Lynnette off because as soon as Lynnette came off court, she asked for one of Blaise’s speciality cheese and bacon burgers in a lightly toasted brioche bun. 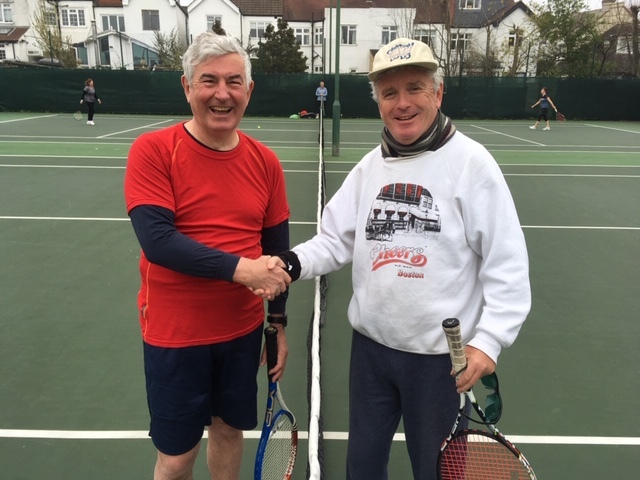 members of the Millennium Cup squad, Dougie, had already bonded with his opponent Patrick, a fellow Scot and their cracking match deserved its place on centre court. Patrick took the first set with Dougie fighting back to take the second. Given WGTC’s luck on match tiebreaks, we were feeling a little jaded but, fortunately, Dougie’s canny play and incredible sliced angle shots meant that he successfully won through 10-6, helping to claim WGTC’s second victory of the day. 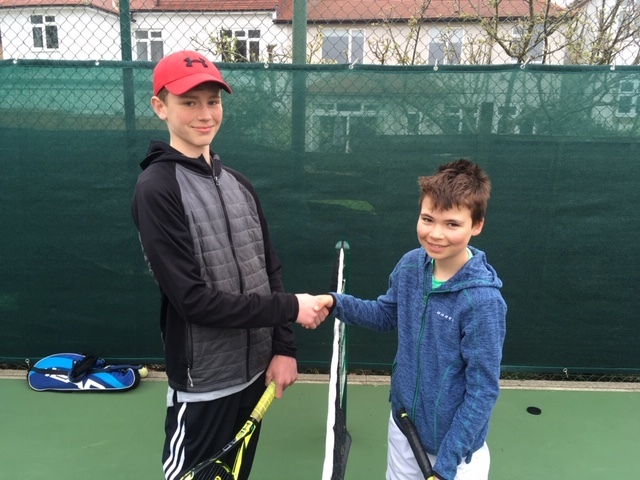 We had tried to match the junior boys fairly but, on the day, Wigmore’s Oliver was that bit older and taller than Lucas and despite his dogged play and excellent attitude of never giving up, Lucas could not get the better of Oliver. WGTC went another match down but, for the mental health of the spectators, it was good that we did not have to go through another match tiebreak, but this proved a short-lived respite from the stress and strains of match play. On court 3, WGTC’s Kyle sisters were in action against Erika & Sharon in the penultimate doubles game of the day. An extraordinary match ensued with Erika & Sharon taking the first set 6-1, followed by a strong fightback from Candice & Esme, who inflicted the same 6-1 scoreline on the Wigmore duo and so, yes, it was another match tiebreak that, in keeping with the general trend of the day, went to Wigmore. 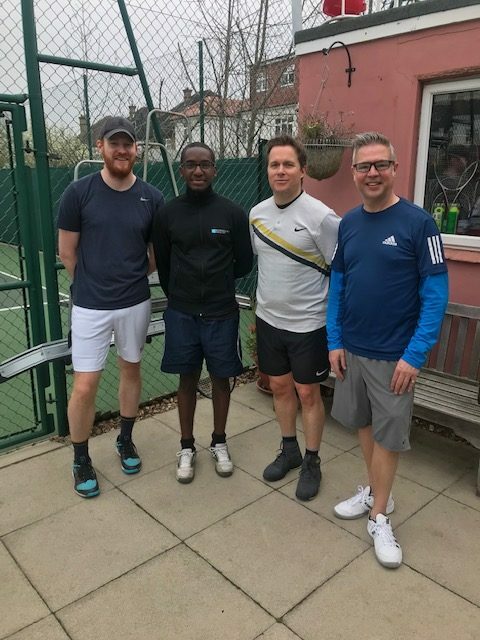 The final match of the day was the men’s doubles featuring WGTC’s Jon & Ben against Fabio, who was playing again as, unfortunately, Wigmore’s original player was injured, with Nick, Wigmore’s captain. As always, WGTC enjoyed hosting Wigmore and while on this occasion Wigmore won the battle 6-3, it really could have been different given had WGTC tipped the balance on all three of those match tiebreaks. All in all, a good, competitive battle. Special thanks to Blaise and Jo for the catering, which included baking skills as well as BBQ expertise. Thanks also to the team for contributing to the cost, clearing up on the day and generally helping to maintain WGTC’s reputation as a friendly host. 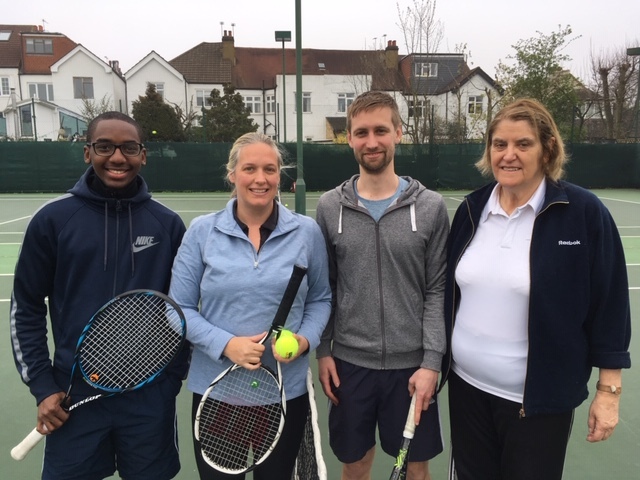 Women’s Singles: Jo Kiernander d Lynette Boot, 6-3 6-0; Men’s Singles: Tom Cooper lost to Partha Mahendran, 6-1 6-1; Women’s Over 40 Singles: Andrea Thompson lost to Linda Patto, 7-6 5-7 [10-5]; Men’s Over 45 Singles: Douglas Kerr d 3-6 6-4 [10-6]; Girls Under 16 Singles: Izzy Marin-Curtoud lost to Edie O’Dwyer, 4-6 6-1 [10-5]; Boys Under 16 Singles: Lucas Govan lost to Oliver Mcmullan, 6-0 6-0; Women’s Doubles: Candice Kyle & Esme Kyle lost to Erika Behling & Sharon Gould, 6-1 1-6 [10-5]; Men’s Doubles: Jon Elwes & Ben Rowley d Nick Eastwood & Fabio Dias, 6-3 6-3; Mixed Doubles: John Nicholl & Carole Britton lost to Fabio Dias & Clare Sanderson, 6-1 6-4.